Spring is here and that means it’s time to break out those springtime floral fragrances. OK, I know that I need no excuse to rock a floral fragrance and will do so all year round (why the heck not, right?) but for those of you who like to stick to a more seasonal fragrance wardrobe then now is the time for flowers. And what a wonderful time it is – the sun is shining (most of the time), the flowers are growing and the bees are buzzing – all of which can be accented by the expert application of a spring floral. 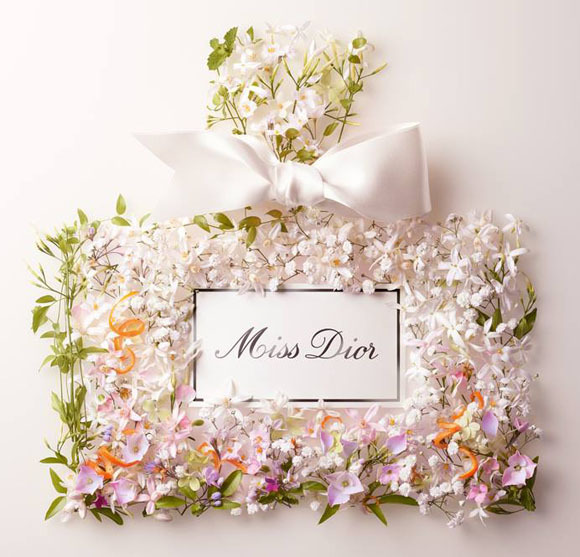 For this spring, venerable fashion house Christian Dior is launching a more floral version of their popular flagship fragrance Miss Dior (formerly known as Miss Dior Chérie and a completely separate fragrance from 1947’s Miss Dior which is now known as ‘Miss Dior Originale‘ – got that?). The perfume is called Miss Dior Blooming Bouquet, a spring floral that is billed by Dior as being more “delicate and light” than the original. Dior’s in-house perfumer François Demachy describes Blooming Bouquet as being “like a springtime bouquet with a hint of elegant and light woody notes” making for a composition that ensures that “Miss Dior keeps her promise of love”. That’s a pretty apt description as far as I am concerned, however I would concede that Miss Dior Blooming Bouquet is much more of a floral musk than it is a woody floral. But in terms of being perfect for the spring season, this bouquet is absolutely spot on. Miss Dior is to Dior what Coco Mademoiselle is to Chanel. This means that both perfumes are modern, contemporary and youthful introductions to their respective brands and serve as more easy-to-like counterparts to perfumes such as N°5 and Poison. This of course means that both fragrances (Miss Dior especially) don’t push the boat out in terms of their olfactory signature, staying in the safe confines of the well-liked ‘fruitchouli’ (i.e. fruit, flowers and patchouli) genre of perfume. What they do have in their favour however, is quality both in terms of their raw materials and the execution of their compositions. Miss Dior Blooming Bouquet follows in the same vein as Miss Dior and is an incredibly easy to get on with spring perfume. It opens with crisp and dewy fruit and floral notes that definitely feel more pink than green, although there is a tiny hint of something grassy lurking in the background. Surprisingly there is little sweetness (a quality that was abundant within Miss Dior) with the bitter facets of grapefruit and mandarin thankfully drying out any hints of sugar that may have been there before. The overall impression of these notes in the opening is of ripe, lush fruits ready to be picked – a feel that is very much in keeping with the mood of the season. Dior’s use of flowers in Blooming Bouquet is well, rather bouquet-like. The flowers themselves are rather vague, with the notes listing peony, however the effect is more like a melange of rose, lily and something similar to but not exactly like hyacinth. It would be nice to see a bolder use of flowers, perhaps with a big skanky jasmine note, or a rosier hue throughout or even just a more defined use of materials, but overall the impression is of a pastel-coloured bouquet of fresh spring flowers. What’s not to like about that? Nothing, that’s what – nothing. In the base, Blooming Bouquet becomes a standard patchouli-musk affair that is simultaneously clean, diffusive and ever-so-slightly creamy. Usually, one would find disappointment in such a pedestrian use of materials however, in this particular fragrance the airy, zippy feel that these ingredients creates is very much in coordination with the style of the fragrance and is incredibly evocative of busy springtime air, filled with pollen and bees. 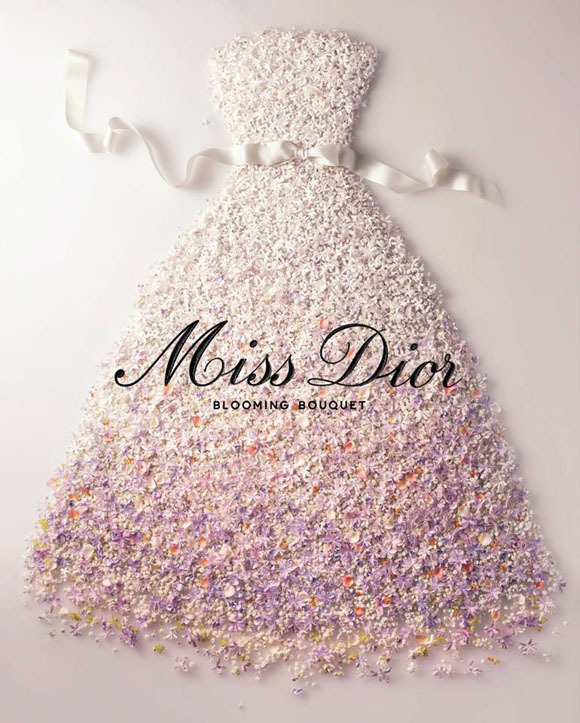 Despite the fact that it isn’t a massively true take on spring flowers, Miss Dior Blooming Bouquet is nicely put together and contains just the right level of contrast between effervescent pastel florals (pastel being the colour du jour, fragrance wise) and rich patchouli. It’s easily my favourite interpretation of the current Miss Dior signature, displaying those pretty in pink flowers and fruits without any of the cloying stickiness. Would I personally pick it for my spring perfume? Perhaps not, it is a little bit too fresh for my liking (there’s sadly no flowery funk) but I would certainly recommend it to anyone looking for a pretty and unfussy floral for spring. As with all things Dior, the quality is of course, top notch. 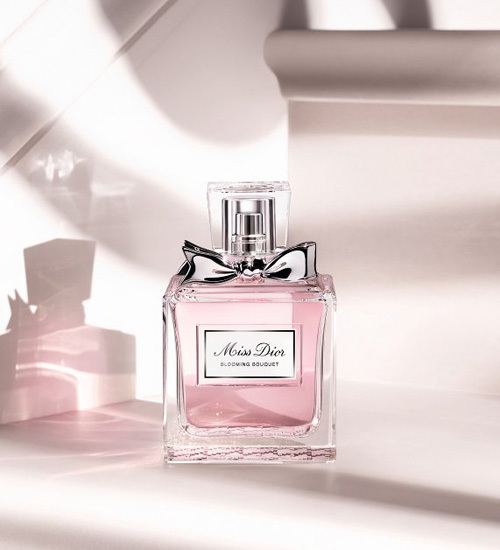 Dior’s Miss Dior Blooming Bouquet is available in 50ml (£45.90) and 100ml (£66.45) Eau de Toilette. Sample, notes and quotes via Escentual. Image 1 & 2 via missatlaplaya.com. Image 3 via chicprofile.com. Posted in Christian Dior, Feminine, Flanker, Floral, Perfume Reviews and tagged Blooming Bouquet, Christian Dior, Dior, Feminine Fragrance, Flanker, Floral, Francois Demachy, Miss Dior, Miss Dior Blooming Bouquet, Spring. Bookmark the permalink. Sounds like it does the job well but I can’t yet get over Dior calling Miss Dior Cherie, Miss Dior. I need to get past it, I know. I wasn’t even a fan of the original! Anyway I wore OJ’s Champaca yesterday for the first time this year. It’s a green floral that feels perfect for spring. I really enjoyed wearing it. It does indeed. You expect a safe but pretty spring floral and that’s exactly what you get! The name change is more confusing than anything else. Like you, I’m not a massive fab of the Originale but it does seem a bit odd to rebrand the scent entirely – I personally liked ‘Miss Dior Cherie’ as a name. Perhaps each incarnation of Miss Dior is intended to represent the women of their times? Champaca is an absolutely wonderful choice for spring.